In his May 25, 2012 Opinion in the case of Housing and Redevelopment Insurance Exchange v. Michaels, No. 2011-Civil-6121 (C.P. Lacka. Co. May 25, 2012 Nealon, J. 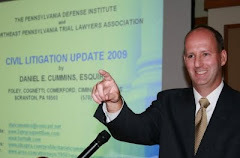 ), Lackawanna County Court of Common Pleas Judge Terrence R. Nealon addressed issues that arose in a case where an insurer and a claims administrator, who had both paid medical expense benefits to a police officer injured in a motor vehicle accident, filed against the officer seeking to recover subrogation liens and claims against the officer’s third party settlement with the negligent motorist. The injured police office filed Preliminary Objections seeking to dismiss the subrogation claims for benefits paid under the Worker’s Compensation Act on the grounds that the Court of Common Pleas lacked jurisdiction to decide workers’ compensation liens. The officer also filed a demurrer to any subrogation claim based upon the Heart and Lung Act since that lien was allegedly barred by §1720 of the Motor Vehicle Financial Responsibility Law, 75 Pa. C.S. §1720. The Defendant police officer also asserted that carriers' Complaint required more specificity with regards to the exact amount of the lien being claimed. Judge Nealon ruled that the Court of Common Pleas courts do indeed retain jurisdiction to resolve subrogation lien disputes involving the injured party and the Workers’ Compensation Act and other state laws. The Court ruled that since the subrogation controversy revolved the construction of 75 Pa. C.S. §1720 as it related to the Workers’ Compensation Act (and in particular 77 P.S. §671), the Court held that it retained jurisdiction to decide this matter. Judge Nealon also ruled that the police officer’s demurrer to the carrier’s subrogation claim for Heart and Lung payments should be sustained since §1720 did not grant to the municipal employer’s insurer a subrogation lien against the tort officer’s recovery in this context. The Court did deny the Defendant police officer’s request for a more specific Complaint in that the Complaint adequately notified the police officer of the claims against which he must defend. With regards to the apparently unspecified gross amounts of any subrogation lien claimed for workers’ compensation benefits, Judge Nealon noted that there was a statutorily mandated method governing the computation of such subrogation interests. Judge Nealon found that more specific information in this regard could be ascertained during the course of discovery. Anyone desiring a copy of Judge Nealon’s detailed Opinion in the case of Housing and Redeveloping Insurance Exchange vs. Michaels may click this link.